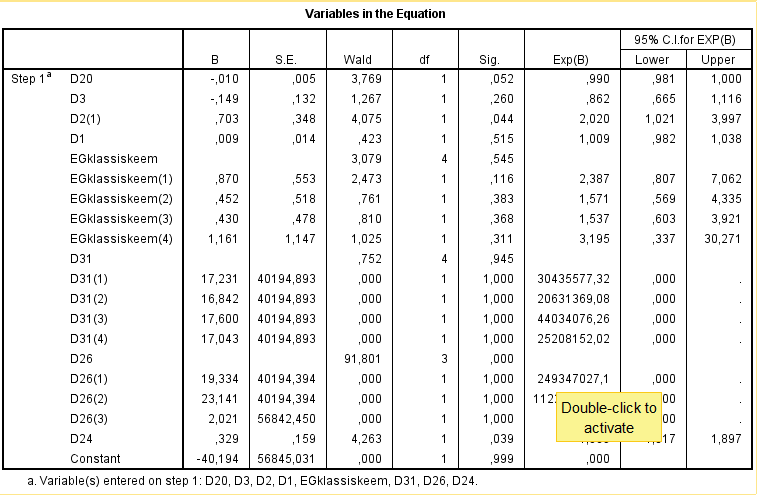 I had a very large value for Exp(B) in SPSS binary logistic regression. What is wrong and what should I do? This usually indicates a problem with Quasi-Complete (categorical variables) or Complete Separation (continuous variables). Complete Separation: some breaking point in a continuous variable where target has only one type of outcome on either side. For example, if $x>5$ then y=1 in all cases and if $x\leq 5$ then y=0 in all cases. Not the answer you're looking for? Browse other questions tagged logistic spss regression-coefficients exponential separation or ask your own question. Binary or Multinomial Logistic Regression? Why does -2*LL differ when using binary logistic regression vs GLM binary logistic in SPSS? What's the reason for large beta coefficient standard error and estimate in binary logistic regression?